Nairobi, Sep 9: Four years ago, Kenya’s Wilson Kipsang was under pressure to win the Berlin marathon on his debut, but he believes that will no longer be his concern as he takes on Olympic champion Eliud Kipchoge on September 24. Kipsang worked hard in the 2013 event in Berlin to clock 2:03.23 hours, bringing the world record down by taking 15 seconds off the time set on the same course by his compatriot Patrick Makau (2:03:38), reports Xinhua news agency. But that record didn’t last long in Kipsang’s possession. A year later (2014), yet another Kenyan, Dennis Kimetto, became the first man to break 2:03:00 mark for the marathon when he stopped the clock at 2:02:57. It is this mark that will be up to be shattered when Kipsang, Kipchoge and Ethiopia’s Kenenisa Bekele face off on September 24. “I’m better placed than anyone else to break the world record. 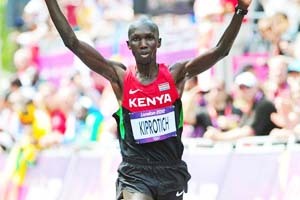 I have done it before and believe I am able to do it again,” Kipsang said on Friday from Iten. The secret to his strong performance is down to training and Kipsang believes he is hungrier to prove his worth in his third show in the German capital. Watching them train and put in the hard work and miles will make you appreciate the meaning of the phrase “train hard, win easy”.